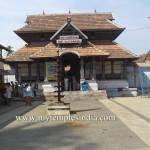 An ancient Hindu Temple at the heart of Kozhikode city, dedicated to Lord Shiva. The Lord Shiva of this temple is considered as the family deity of Zamorins of Kozhikode so the temple has a royal insignia on it. The sprawling temple has many other �Upadevatha shrines within the temple complex. A separate temple dedicated to Lord Vishnu is the most important among them. This is the venue of famous �Revathi Pattathanam�, an annual assembly of scholars. The legend is that, before coming under the Zamorins, the temple belonged to a Brahmin family. The Zamorin rule the temple was under a Brahmin family. The Zamorin ruler forcefully ousted them; he even killed few of them. Thus, due to the Brahmahatya sin, the Zomorin�s royal family came to the verge of extinction due to the absence of progeny. So, on an advice from a saint, Zamorin started this ritual to please Lord Shiva of the temple. The ritual still continues, although it lost its royal charm.